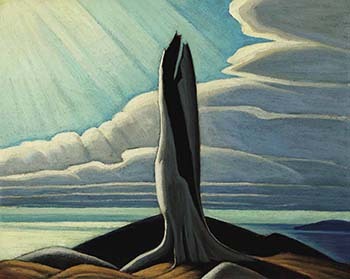 The Old Stump, Lake Superior is the oil sketch for one of Lawren Harris’s most important works, the iconic North Shore, Lake Superior. It is a cornerstone piece in the Harris holdings of the National Gallery of Canada and a centerpiece in the series of North Shore works. Much has been written of North Shore, Lake Superior, and of its equally magnificent sketch, The Old Stump, Lake Superior. The generous lending practices of the Band family have resulted in its inclusion in several important exhibitions and catalogues, where curators, historians, collectors and the public have been able to admire and study it. Together with the graphite drawing, also in the collection of the National Gallery of Canada, we can follow the beginning of Harris’s vision through to its final expression. It is a fascinating journey. The specific traits that make North Shore, Lake Superior such a renowned painting are worked through between the graphite drawing and The Old Stump, Lake Superior. In the drawing, a few additional stumps remain standing in the landscape, distant and stark. Having annotated the drawing with observations as to colour and light conditions, as are many of Harris’s drawings, Harris no doubt carefully contemplated the drawing, measuring its effect, considering the strongest points within it, and then omitted these extraneous stumps and reworked the sky. More critically, the stump has been completely isolated in this oil painting and in the National Gallery of Canada’s work. The tree is alone, rarified and dignified. Burned out from its interior, the scarred wood has been left silver-white and skeletal - cleansed by fire. The great beauty in the work is found in the sense of yearning life that we feel in the trunk; a sense of striving, of reaching and seeking, permeates the work. The light streaming in from the left enhances this feeling, seen in its final format in this oil sketch. Two large cloud formations on the left hand side of the drawing have been omitted, and the beams of light, repeating directionally in the beautifully billowing cloud formations, have become a focal point in this work and the National Gallery of Canada’s canvas. They light The Old Stump, Lake Superior in sharp relief and whiten the upper surface of the clouds that float, weightless, high above the land. The earth is rounded and upthrust, bringing the stump closer to the sky. These two changes are critical to The Old Stump, Lake Superior and remain unchanged through to the canvas. All of the factors that make the canvas North Shore, Lake Superior such an iconic work are present in The Old Stump, Lake Superior, and are seen therein for the first time. Thus it marks the birth of a Canadian icon. It seems in this marvelous work that we, looking at it, are the stump. Touched by the light’s divine revelation, we can receive knowledge, truth and clarity. And as the wizened stump, burned and alone, is touched by the light, so we too can achieve a state of transcendent being if we open ourselves to it. Where there is neither suffering, desire, nor a distracting sense of self, we can find nirvana. 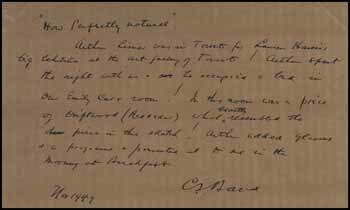 In Harris’s theosophy, expression of the mystical was his mission. He sought it in his work, he sought it in his daily life and it was his duty as a painter to be an instrument of communication for greater ideas. Through his visionary skill, he has transformed the stump from its original state to that of a greater state, with the light and clarity of his vision. Harris and Charles S. Band were friends as young men. 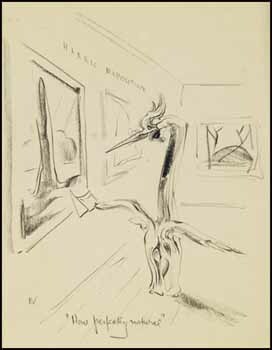 After Band returned from working in New York, where he had begun to collect art seriously, Harris introduced him to his fellow Group of Seven painters, from whom Band would acquire work directly. The Old Stump, Lake Superior, through the estate of Charles’s daughter Helen E. Band, is offered here for sale for the first time since Charles S. Band acquired this iconic work directly from the artist in 1946.